These days it seems like everyone is hopping on the do-it-yourself (DIY) bandwagon. Change your own oil? Easy. Restore that old dresser? Done. Put down new floors in the living room? On it. There are plenty of reasons why the DIY trend has taken off, from the feeling of accomplishment when you finish to the amount of money you (usually) save. And people aren’t just DIY-ing home decor and renovations… they’re also DIY-ing their finances. 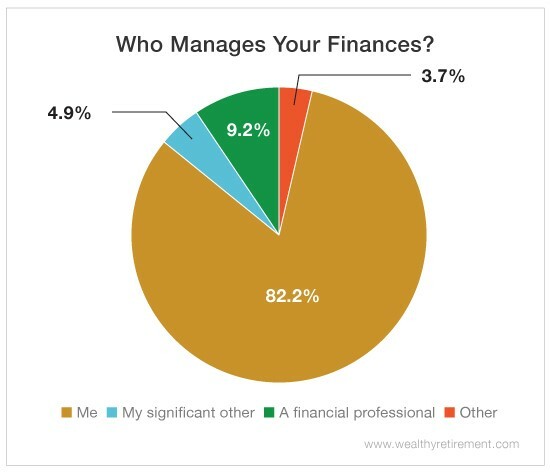 According to our survey, a staggering 82% of Wealthy Retirement readers manage their own money. It’s most likely due to the lack of trust people have in financial advisors, especially with the fiduciary rule being overturned. The rule required financial advisors to act in their clients’ best interests. Without it, advisors no longer have to, meaning there’s a greater chance they’ll recommend what’s best for their own wallets in terms of commissions and fees. That DIY investing strategy is sounding pretty good right about now, huh? Handling your own finances gives you complete control – and knowledge – of what’s being spent, how much you’re making on your investments and where you stand in terms of retirement readiness. And you don’t have to worry about being ripped off because hopefully you’re acting in your own best interests. Plus that proud feeling – and the investing confidence that comes with it – when a money decision you made yourself pays off big? Priceless. But if you’re new to investing (what exactly is the difference between a traditional IRA and a Roth IRA, anyway? ), DIY money management can be intimidating. Not to mention it works only if you actually know what you’re doing. Fortunately there are plenty of resources to help you start planning – and saving for – the retirement of your dreams… no money-grabbing financial advisor required. Like this ultimate retirement survival guide from my colleague Marc Lichtenfeld. Inside you’ll find all the income-generating and money-saving strategies you need to make your golden years the most golden. There’s even an entire section on making the most of Social Security – something we all need to read. Check out the book here… it’s a game changer!